99 Bottles Of Beer On The Wall. With a name like this, it's just begging to be visited, no?! Now if I could only get out of there without singing a verse or two from their namesake song! We visited 99BOBOTW on the way out of Santa Cruz. From the locals we talked with, the place seems to have a decent reputation as a bar with a whole lot of good beers and ambiance going on. Downtown Santa Cruz is set approximately 1 mile back from the beach and it's kind of a long mile of walking distance if you're at the beach, boardwalk, or pier. 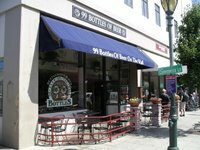 However, the downtown district does have a smattering of restaurants, shopping, bars, and nightlife to give a bit of diversity to the available options. There's a parking lot and garage adjacent to the building, so getting there by car is not too difficult. Once inside, there's a medium-sized L-shaped bar with all sorts of beer and miscellaneous paraphernalia on the walls. 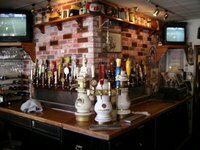 The bricks behind the bar are inscribed with names of patrons who have consumed the aforementioned "whole lot of beer." The program goes something like this, though I may have the numbers wrong. You're given a card, with room for 99 punches. Eventually, after drinking 99 beers (they don't need to be unique), you've completed one punch card and get something somewhat trivial like a tiny little plaque on the wall underneath of the proverbial 99 bottles of beer on the wall. At least something trivial compared to what comes next. Oh yeah, and a new punch card. Fill up 10 of said punch cards and you get an inscribed brick in the wall behind the bar. 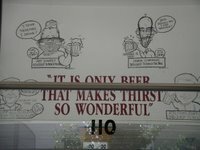 Fill up 25 and get your caricature drawn above the outside entrance to the bar. 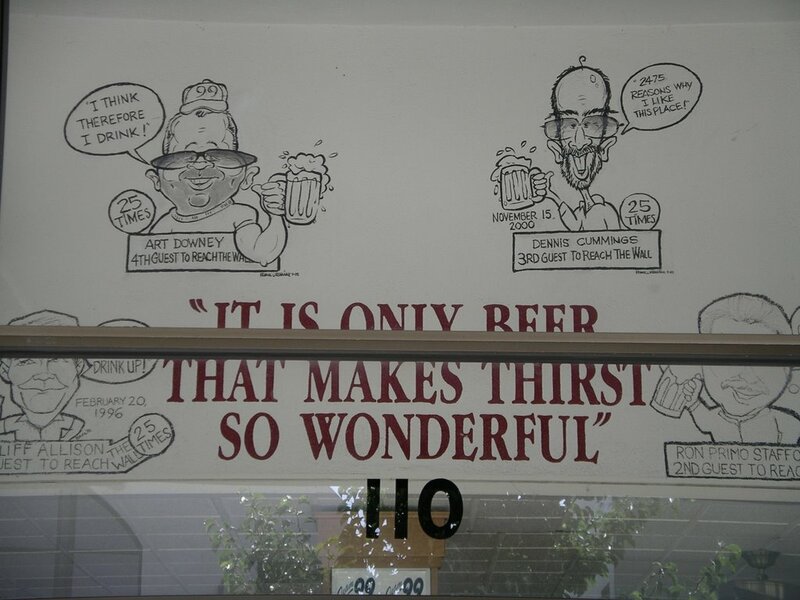 We just so happened to be there when two of the five gentlemen whose caricatures on the wall were there. Now, hold on, let me think....yes, I see how their strategy has worked out! Bar's been around for about 11 years. They've been going there from the beginning and have drunk close to 5 beers a week there. Now, drinking a five beers a week in one place is not all that impressive....but keep that up for years, heck even months, and you've got to admit.....Well, I don't know what you have to admit, but..... :) So, I could go into the various styles and brands of beer that they carry. But, that would get kind of monotonous. They have around 40 taps and advertise over a hundred bottles. 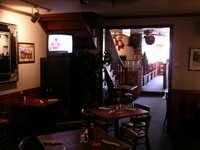 The staff that we met was friendly and knowledgeable. The crowd seemed to be enjoying themselves. The food menu appears as attractive as the beer menu. The place just generally seems to have a good karma and always interesting beer to choose from California and beyond. 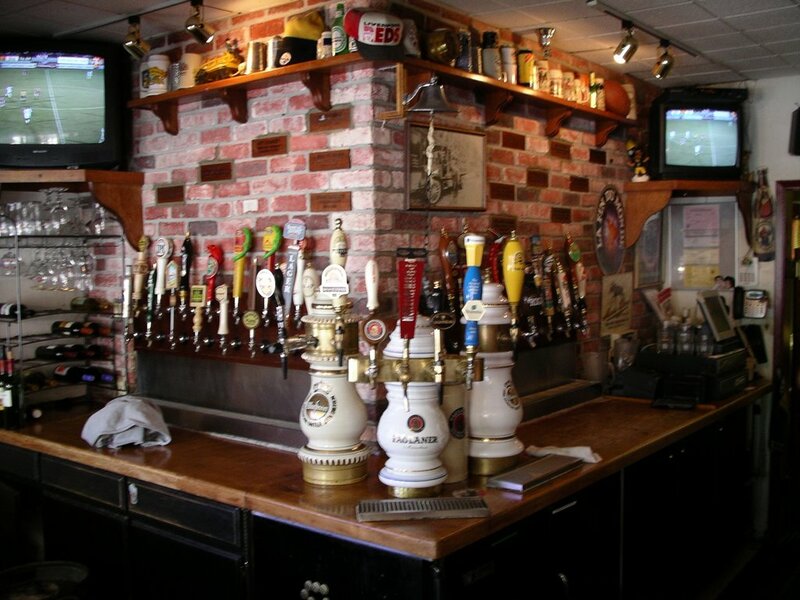 According to the bartender, they get a decent and knowledgeable beer crowd and rotate inventory frequently. We selected the Firestone Double Barrel Stout (ooooh, before noon too!) and Big Sky Moose Drool. Also, tried a sample of the Kona Fire Rock Pale Ale, but left it at just a sample. (97 bottles of beer on the wall...just doing our part ;-) Unfortunately, there is an upstairs "Biergarten" that was closed and we didn't get to check out. Apparently, though, the beer selection is no different. Check it out if you have a chance as you're heading up or down the California coast. Take one down and pass it around....Bet you'll find a good time and good brew to while away the day and night. And, get a punch on your card as you aspire to seeing your likeness on the wall. Heheh...interesting idea. Nice to hear it isn't all gimmick and no substance. So that makes 5 CA posts from you. 95 more to go ;-) I'm looking forward to them. Especially the one involving redwoods, beer, and a train.